Are You Taking Time to Reflect During This Holiday Season? This year I have come to fully realize how wonderfully our holidays and the end of the year line up. Thanksgiving. Advent. Christmas. The New Year. How much better can it get?! November brings Thanksgiving, and although I feel many gloss over the treasure of this holiday, skipping from October to Christmas, Thanksgiving deserves its rightful place as one of the best holidays. It is a wonderful celebration of all that we have. Focusing on thankfulness and being appreciative of what we have lays a foundation for festivity! How can we not celebrate, when we remember - no matter how difficult life is - our many blessings! 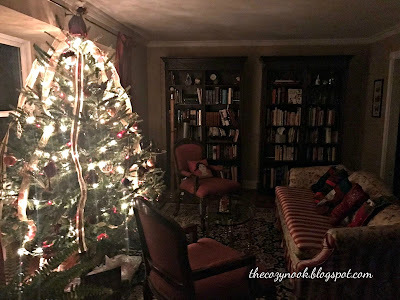 Thanksgiving then rolls into the holiday of Christmas, with Advent as its holy introduction. To be honest, I haven't thought about advent in years. Our church doesn't really focus on advent, and until now, I hadn't embraced it in my own personal life much except for buying the occasional advent calendar, filled with some sort of treat as a window opens each day. However, this year I desired to teach something special to my middle school girls at church with the approach of Christmas, and recalled this beautiful season of Advent. Advent means "coming". And for those of us who celebrate the birth of Jesus this Christmas, we celebrate His coming - first as a baby, a divine human, thousands of years ago and in the future, as the triumphant Lord. During this month of December, the hustle and bustle of preparing for Christmas consumes many of us - cooking, cleaning, decorating, preparing, shopping, spending... At times, it may feel overwhelming. Yet, the season of Advent interrupts all of the active clatter and reminds us to reflect and prepare with proper hearts and attitudes for the celebration of our Savior! Advent causes us to pause each week and focus on the real reason for the season. Advent encourages us to set aside worldly cares and remember that we have a Savior who came to earth for us and loves us so dearly. Advent establishes us and gives us a fresh awareness of why we do what we do. Advent is a precious time of preparation and joy! Then Christmas will come. And the world will stop. For a moment. And remember Christ's birth. Worshipful songs of the silent and holy night will ascend. Cheerful cries of joy to the world shall fill the air. Friends and family will gather to share special moments with one another, giving and receiving love. And all of this ushers us into a brand new year where we can start afresh, with new power and purpose to live more meaningful lives. Are you taking time to think about it and reflect? May you and your loved ones be blessed! My life can oftentimes feel pretty chaotic. I feel like a kid, sitting on one of those playground spinners with someone spinning me round and round, and I am feeling content and desperate altogether! "Please stop spinning! This is too fast!" My daughter has a ballet performance this weekend. My oldest son is graduating this year. I have three kids starting soccer season. My oldest son is graduating this year. I am trying to wrap up the school year. My oldest son is graduating. My husband's job became exponentially challenging within the past couple weeks. The house needs to be cleaned. My oldest son is graduating. Meals need to be made... Oh, and have I told you that my oldest son is graduating? Yep, and with this graduation thing comes more deadlines - for his ceremony, his party, his admission into college. He has interviews for co-ops, meetings to attend, tests to take ... And guess who feels responsible to keep track of all of this? And that can be so hard to do; can't it?! With life's hectic pace it can be so challenging to quiet our hearts and stop whatever we are doing so we can create white space and have some extra breathing room. Calendars are full. Highways are busy. Minds are active. There's always a lot calling to us. If we hop on social media - the sometimes necessary evil, it can pull us in quickly, causing discontentment, fear, and a general sense that our lives pretty much stink. But not only that, it adds to the chaos. It adds extra info and worries and thoughts that we really didn't need to add to our list of mental juggling. I, myself, often have to step back -- again -- and create boundaries, trying to limit myself to social media's latest rendition of "Beauty and the Beast". But this morning, I chose stillness. I sat alone, with God's Word and in prayer. I submitted my soul to the Lord. I calmed my heart and mind down. I thought about some of the chaos and struggles of life during a moment of quiet, rather than in the harried moments of my day. And it made a world of difference! We need peace and quiet. and minds to stop and be still. The way we cope and build and succeed. 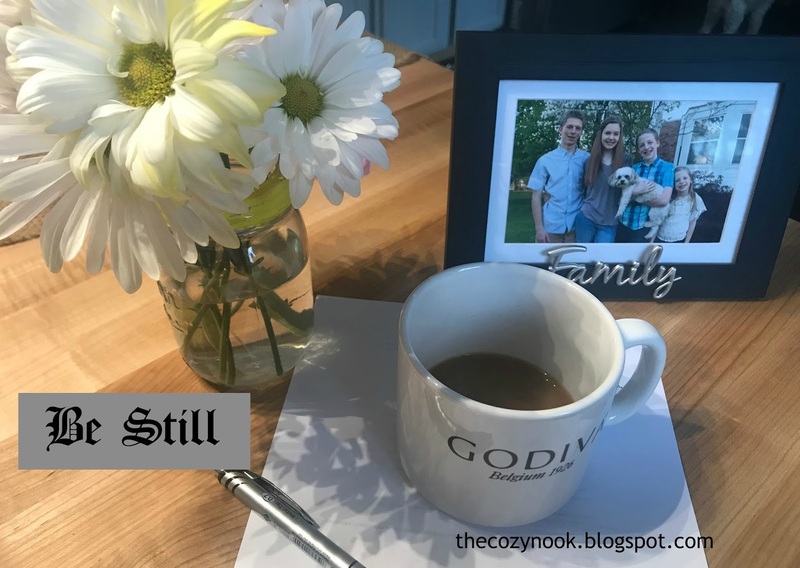 Have you been still lately? 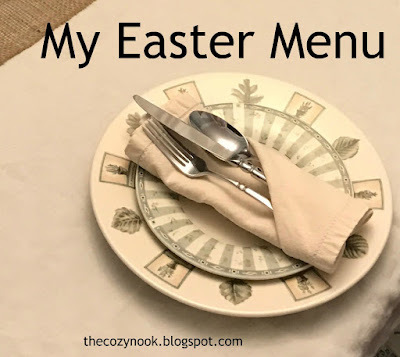 Easter is around the corner, and I am hosting a small gathering with my own family (6 people), my parents, my sister, and my niece. It should be celebratory yet also very doable. My mom always plans a big egg hunt for the kids, where she hides plastic eggs that are filled with candy and money, and everyone loves that. AND, I love celebrating the resurrection of Jesus Christ! I thank the Lord for His sacrifice for us and for His victory that day - over sin and for all eternity! My teen daughter has a lot of excitement and energy regarding the holiday, and she has been a large help with planning. She has ideas for decor, like carnations in mason jars and pastel banners, and has helped get everyone in our household interested in helping with at least one menu item. So, Easter is a big thing around here, and with special occasions come FOOD! Strawberry Lemonade - My daughter makes fresh lemonade and blends up some frozen strawberries to mix inside. *These items are being brought by my family. 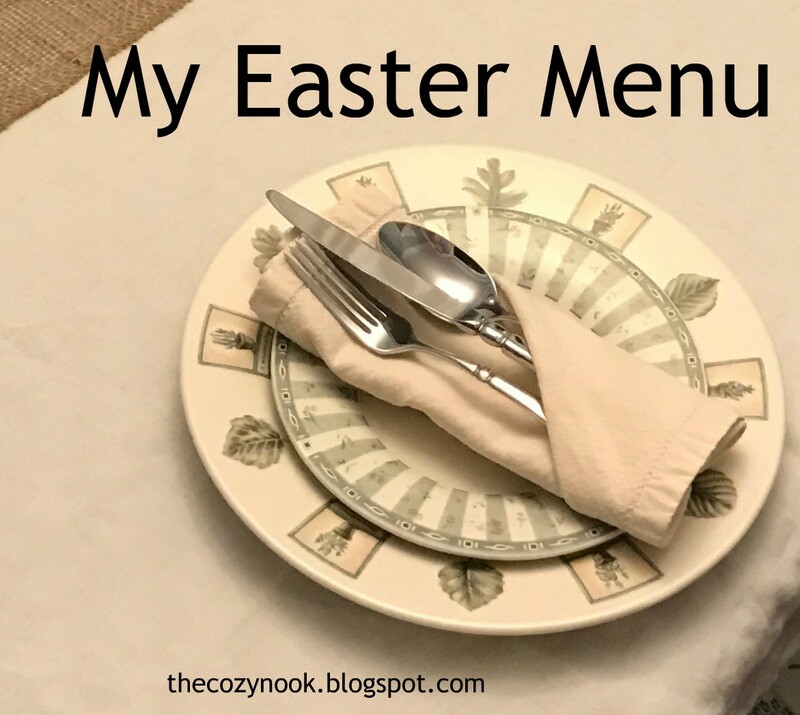 What's on the menu for your Easter? 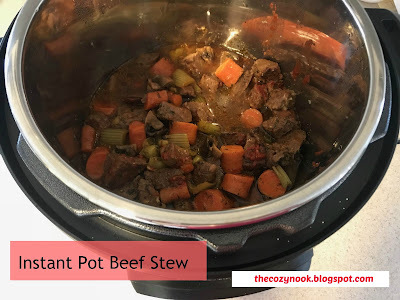 For Christmas, I received an Instant Pot, and I will have to do another post to tell you how I have liked it so far. I finally made my first all-in-one dish the other day - Beef Stew - courtesy of Little Spice Jar. She calls it, "Irresistible Beef Stew", and she is right on with that! This stew was divine! We enjoyed it thoroughly! Following is my version. I used different mushrooms, omitted the pearl onions, and used some seasonings from a homemade Ranch dip recipe... and I didn't even have all of those ingredients, but I put together what I could, and to be honest, I don't know if I would change a thing. The Ranch dips at the store have MSG in them, which I try to avoid in general, and homemade versions have dried buttermilk, and... well.... I was a bit hesitant to put that in my stew anyway. We devoured this stew! Enjoy! First, sear the meat. Season it with salt and pepper and then sear it by browning it on each side in melted better. You can do this in the Instant Pot on the saute setting or in a separate pan. Mix the 1 1/2 cups of beef broth and 2 T cornstarch in a bowl or large measuring cup. Whisk well until the cornstarch dissolves. I do this with a fork. Put ALL of the ingredients in the Instant pot and put it on the Meat/Stew setting. Once pressure builds, it should say 35 minutes on the display. When finished, allow the stew to rest for 15 minutes and then release the rest of the pressure. VOILA! You have yourself a wonderful meal! You can serve this with mashed potatoes, buttered noodles, crusty bread, and/or salad. The other day I went for a drive - the three of us - just me, myself, and I.
I hopped in my awesome minivan, picked up a luxurious latte, and headed towards the neighboring city, hoping to see its Christmas lights still aglow atop the downtown stores and buildings in all sorts of glorious colors! As I headed closer to the scene, all I saw was FOG. My heart sank. FOG? That's it?! I thought for sure I had missed it -- my chance to see the lights just one more time. For a quick moment, I remembered how my phone alerted me before I left. There was going to be dense fog all evening. I did hesitate to go out, but I really wanted some time alone, so I forged ahead. I continued through the thick haze with a sufficient amount of discouragement, but I hesitated to give up. As I was about to cross the bridge into downtown, the spectacular display began. The lights were still up! My heart felt alive! It's amazing how WEIGHED DOWN my heart felt when all I saw was FOG, and then how quickly my heart SURGED WITH POSITIVITY when I could see beyond it! FOG hinders us and distracts us daily. It, all, causes us to FOCUS on the FOG and FEEL defeated. in the right direction. THEN we will experience more of the abundant life that God wishes us to have! 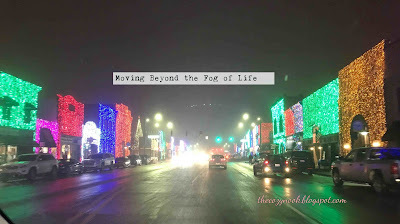 Are you bogged down by the FOG of life? ...let us throw off everything that hinders and the sin that so easily entangles. I am up this morning with a childhood anticipation. Today is the day our household celebrates. It's Christmas Eve, and our family is spoiled to share this day together, a day early. For years we traveled to both sides of the family on Christmas Day, so we chose to set this day aside just for us. As I sit awake, with my Christmas lights aglow, I treasure the silence. I am longing for a fresh, hot cup of coffee, yet I fear to start the process of making one lest I awake the others in my home. I am enjoying the peace of this morning, when my soul can be refreshed and my heart feels the peace and joy of just being alive, having a life with good things - even when life can be so tough at times. when the SACRED meets REALITY. We sing those words with hope and with confidence, and it creates a very nostalgic picture of when Christ was born. It was a very sacred moment indeed! However, we must remember, that Jesus - the Son of God - came to earth, a place full of heartache and sin and strife, a place full of less than the ideal many times. When He was born, the scene was not as pretty as we sometimes imagine. Our Savior was born in a stable, when his parents found no comfortable place to birth him and welcome him, and the arduous process of taking care of a special newborn baby took place that day. And although the situation to welcome our Savior was a humble one, we focus on the glory of it. Singing "O Holy Night", "What Child is This", "O Come, O Come Emmanuel" and much more puts our hearts in a worshipful, thankful, sacred mode where we allow our reality to become dim and accept the awesomeness of our God and His love for us. I have heard various people say they haven't felt very "Christmassy" or that is just doesn't feel like "The Most Wonderful Time of the Year". Grief, relational difficulties, financial strain, and other pressures of life swarm us and fill our daily lives with intense struggle. YET, there is a Savior. There is a sacred moment when Christ came to earth, to display His love for His creation and to save us from our sins and help us in our dismal reality. May the love of Jesus fill your hearts and home today! First of all, let's get this out in the open... I am not a history buff, so this is one subject in our homeschool where I can feel a bit lacking. Therefore, it is important for me to have high quality resources that I trust and value. Enter Dave Raymond's Modernity course, a world history course that covers 1500 to the present and the maturity of Western civilization. I was sent the DVD course to review, and I must say that I am thoroughly impressed! This course is interesting, engaging, and very informative! Dave Raymond has a great teaching personality. He is not monotone. He speaks clearly and thoroughly, and he has a love and knowledge for the subject of history that comes through his teaching vibrantly! Even if someone is not a history lover, Dave Raymond works hard to pull in his listeners. Dave Raymond begins the course with the reasons WHY we should study history. I love this! After all, many students ask the question, "Why do I have to study this anyway?" Dave Raymond lays a great foundation for learning the subject of history, prepping students' hearts and minds for what they are about to embark upon. The course itself is well-structured, covering a central, exciting topic each week: philosophers, empires, the scientific revolution, the French revolution, wars, rulers, etc. Rather than jumping from subject to subject, there is focus for several days, which provides thoroughness and makes the material easier to understand and more interesting. Quotes from authors and others embellish Dave Raymond's teaching, and the lecture is full of intermittent historical pictures, which help the student to stay focused and also create a visual picture of the events, people, and places he is learning about. The course is a one year course that consists of 27 lessons, 4 projects, a student reader, a teacher's guide, weekly exams, and a year-long portfolio, making this course an excellent choice for any high school history credit! For more information about Dave Raymonds' Modernity course, you can visit Compass Classroom -- https://www.compassclassroom.com/history/modhist. A handful of months ago I did a review for Compass Classroom - a company that has a variety of high quality educational resources for families. If you missed that, you can check it out here. 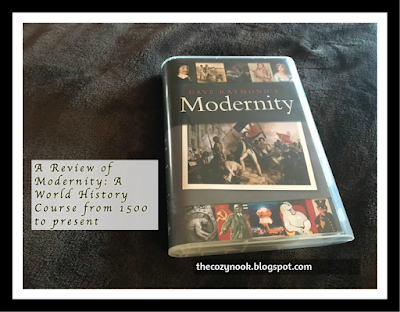 I received a free copy of the Modernity course in exchange for an honest review of the product. All opinions are my own.